Wearing solid-colored clothes is, well, a solid option for any guy. But let’s be honest, we know there are times when you want to mix it up a little and break the mold. Whether it’s a wedding, summer outing, work party, or first date, choosing the right patterns and prints is a perfect way to set yourself apart from the crowd (in a good way). Follow this three-step guide and you’ll be a master of matching patterns and prints in no time. Begin to embrace pattern mixing with subtle patterns and complementary colors. The understated wave pattern on this short sleeve button down goes nicely with the light windowpane checks on the shorts. Top the outfit off with a pair of leather sneakers and let the compliments roll in. This winning combo is perfect for any age—it gives a slight nod to American preppy style and is modern enough to look sharp wherever you go. 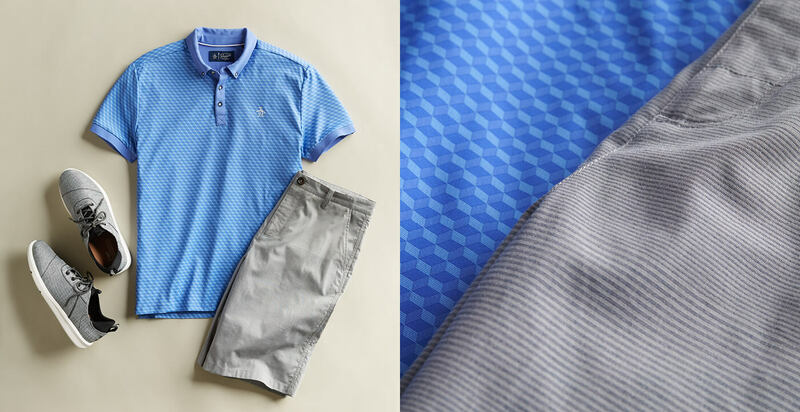 Take pattern mixing to the next level with more complex patterns and prints, seen in this geometric print performance polo and striped shorts. With a bold geometric pattern, you should be a little bit more careful about what you pair it with—try subtle colors and patterns that don’t clash. A toned-down grey horizontal stripe is the perfect compliment, it works together to bring out the uniqueness in each. 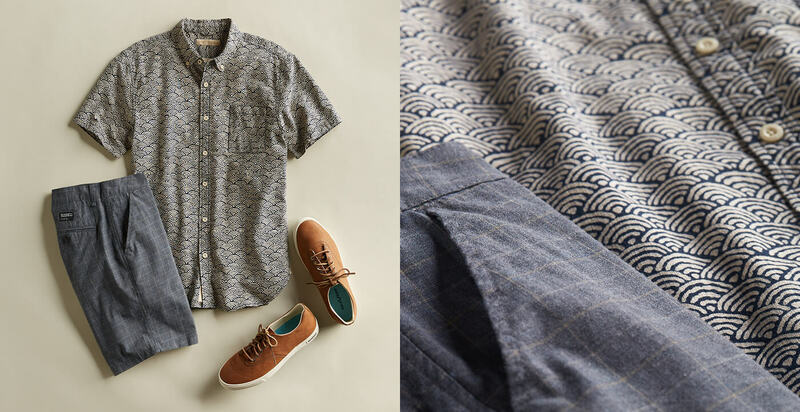 Polos are a versatile option that works well with patterns and prints. Push the limits of pattern mixing with bold and loud patterns. 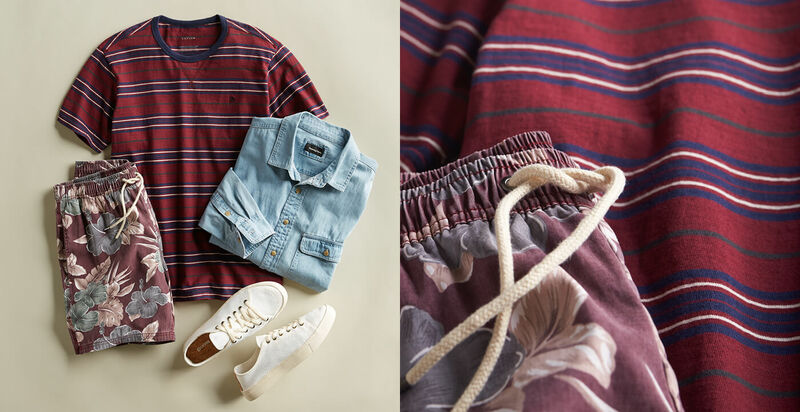 The alternating stripes on this t-shirt stand out when paired with this bold floral pattern, but find common ground with a shared maroon color scheme. When mixing loud patterns and prints, try to add other elements to your outfit that help balance it out—like a denim overshirt or plain white sneakers. When it comes to mixing patterns and prints, you should feel comfortable embracing the opportunity to stand out from the crowd, as long as you keep general style rules in mind. Whether you’re just beginning to experiment with subtle colors and prints, dipping your toe into more complex patterns, or experimenting with loud and bold combinations, we have plenty options to fit your style and comfort level. Ready to try prints in your next Fix? Schedule a Fix & let us know how you want to mix it up.